"Amazing stay! We will definitely be booking again in he future. Thoughtful touches such as rose petals, a bottle of Prosecco and a delicious cake left for us on arrival. Thank you!" "Really enjoyed our stay, the lodge is beautiful and fab location right on the lake"
"An amazing place to visit. We stayed for 2 nights and loved it. It’s a great design and very stylish and has everything you need. The view out onto the lake is superb. It’s a peaceful place where you can relax and unwind. The surrounding areas are easy to explore, and has plenty to offer within walking distance. We will definitely be back." "We have just returned home from an amazing Easter weekend at Pond Lodge, what a beautiful and tranquil place in comparison to other nearby lakes. The location is complemented by the amazing lodges, with Pond Lodge exceeding our expectations. We are looking forward to visiting again"
"Had an Amazing time at Willow Lodge, everything was perfect, could not of wished for a better stay. Florina was very responsive and always available on the couple of occasions that we needed her." "Had a really lovely stay. It’s a beautiful space and area and can’t wait to go back." 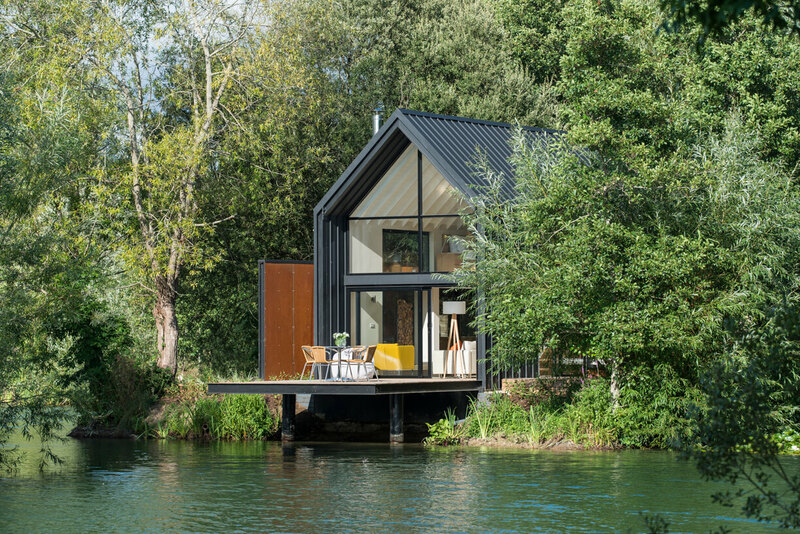 "Amazing contemporary fisherman’s lodges on the lake. Excellent facilities in such a unique setting." "We had such a magical stay here for our anniversary. If you’re looking for a peaceful spot, with beautiful country walks & a cosy fire - look no further! Florina was an amazing host & the place had plenty of suggestions and brochures on what there was to do in the area! Thank you ☺️"
"Great weekend. Lodge was beautiful couldn’t have asked for more. Setting is so peaceful and serene. Communication with Florina was great. Definitely need a car to get about. Will definitely be back, a weekend just wasn’t long enough! Thank you!" "What a fantastic weekend away. This lodge is quite simply amazing...the location is fantastic and a short drive into Cirencester or Southrop. Waking up to the big glass windows looking out into the lake is just what we needed for a country break away from London. Will be booking again soon!" "An exceptional weekend getaway. Relaxing, chilled, fresh air and beautiful views over the lake. We didn't want to leave!" "This place is Airbnb at its finest! We spent our wedding night in this beautiful lodge and it was everything we could have wanted. The hosts went the extra mile and put out rose petals, candles and champagne for when we arrived. This lodge is better in real life than in the pictures! If you’re thinking about booking this place.... DO IT! It will be one of the best Airbnb’s you ever stay in." "A beautiful peaceful location with stunning views and wonderful accommodation! Will definitely be returning." "Lovely, peaceful lodge. It’s stylish, tasteful and beautifully finished with thoughtful touches that add to a great experience. The location is superb and the views and lodge itself are even better than the photos show. Very clean, tranquil and relaxing. Highly recommended." "My boyfriend and I had the most amazing experience at Willow Lodge. Everything was absolutely perfect! Check it was super easy and the views were out of this world! We had hoped for a tranquil break and this most definitely lived to expectation. Angela and Florina were fantastic hosts and answered any questions promptly. I cannot recommend enough!" "really cool property with amazing views over the lake. really nice to turn the fire on and enjoy the views as the evening draws in. property very clean and comfy and within easy reach to explore the Cotswolds"
"From the minute you drive up the drive, you immediately feel that the whole space has been designed perfectly, the grounds, the lodge and the location is stunning! This place is a real gem. We spent two nights here and so far is our best Airbnb experience. Every detail has been with thought out for the guests experience! Highly recommend this wonderful place which is only achievable by wonderful hosts 5* "
"Visited Island Lodge for a birthday getaway and it was everything I expected and more. The location and the lodge itself are absolutely stunning, very well designed and styled. The pictures do not do it justice in my opinion, the scenery and the views through the floor to ceiling glass windows were amazing, especially at night when the stars were out and also in the morning when the sun came up . It was cleaned to a very high standard. I literally could not pick fault with anything, it was just perfect. Florina was brilliant with my request to make changes to my reservation, she was very quick when responding and answering my questions which I am thankful for. I was extremely sad to leave and will definitely be returning this year. By far the best Airbnb I have stayed in." "Beautiful property in a stunning, quaint location. The perfect hideaway. We visited in the winter months and would love to visit in the summer! The log fire was our favourite feature." "What a view! This lodge is immaculate with an insanely comfortable bed and everything you could need to whip up a meal and relax in front of the fire whilst watching the ducks on the lake! The location is peaceful and feels so secluded but is still in close proximity to some lovely walks as well as local villages & towns with plenty of restaurants, pubs and shops. We really enjoyed our stay and have already given details to a few friends who have asked where this amazing place is. Thank you for an idyllic stay!" "A lovely accommodation in an idealic setting. A relaxing stay is guaranteed. The accommodation is super clean and has what you need to cook and eat in. There are local pubs around 20-30 minutes walk away. We will definitely recommend to friends and family." "We feel very fortunate and grateful to have been able to stay at this AirBnb. It is a modern, clean and comfortable space in a peaceful location. I would highly recommend to any couple looking for an escape from London." "Absolutely loved the lodge! The views are beautiful and such a lovely area to be in. We had everything we needed and more for amenities, including special little touches for us. Plenty of space for relaxing, and such a comfy bed! The design and architecture is very clever, with specifically placed lights and trees etc we felt like we had a lot of privacy. We’d love to comeback again and visit in the warmer months to appreciate the outside decking even more! If you want a nice little break away, this is the place to go." Wonderful weekend for two in an incredible setting. We’ll definitely be back! "Absolutely stunning. well worth it. Looking forward to coming again when the sun is out!" "Our anniversary weekend could not have been more special at this little house on horseshoe lake. It is amazing how all the essentials have fit into such a compact space, yet it all feels very spacious. The house has been very well designed and set up! The hosts were very responsive and everything was clearly communicated. I could not recommend this house or the hosts more. Thanks again!" "Very lovely weekend, great host who gave us a list of places to dine and things to do. 100% recommended, all our friends are asking us for details!" "Beautiful house in a stunning and very peaceful location, the service and communication from the host was exceptional." "We had a great weekend at Angela’s place. Florina was quick to respond to all out queries beforehand. She provided all the basics we needed and more. The place was very cosy and the log burner was nice to use on cold evenings. The view from the deck is stunning. It’s very secluded and private with only 2 other houses on either side, but at least 50 metres away. You can walk to South Cerney to Coop and local pubs which took us about 20min. We would definitely recommend booking this place. Thanks again." "What an amazing place in such wonderful scenery. Will definitely be back!" "We had a fantastic stay and loved having a cosy place to return to during a rather drizzly January weekend! Everything was extremely clean, check-in was super easy, and communication really good. We hope we’ll have the chance to come back one day when the weather is better to really make the most of the lakeside location!" "The perfect little get away. Incredibly clean and so easy to get to. House is very warm and cosy yet modern and sleek. A great place." "Very accommodating and easy to communicate with, Great location, design and layout! Highly Recommend"
"Fantastic place on the water. It's possibly even better than in the photos. Very peaceful location, but still close enough to pop into Cirencester. The house was spotlessly clean, and Florina thoughtfully provides a number of essential and unexpected provisions." "We were blown away as soon as we got to the property and fell in love with the place! We were greeted by Florina who was really welcoming and kind. There was everything we could have possibly needed which was really convenient. Florina was kind enough to buy us a cake and a bottle of prosseco which was very thoughtful. The location of the property was stunningly beautiful, with views of the grasslands, pond and lake. The location is really convenient with the cotswolds lake centre and boathouse pub a few minutes drive away. We will definitely be back very soon and highly recommend to book yourselves at this beautiful place for an escape like no other! We were so sad to leave our home for 2 nights more than anything! Thank you much for an amazing time and tremendous hospitality!" "As soon as you arrive it feels relaxing. The lodge is stunning, contemporary, spacious and luxurious. The outside space is just as good. Me, my partner and our two teenage daughters loved it here." "Great host with an amazing place. Could not recommend more - can’t wait to visit again!!" "Can#t recommend this lodge highly enough. A stunning view over the lake from the architect designed luxury lodge. |Very secluded and private. Was a perfect stay." "This home is beautiful and stylish. With amazing views of the lake from every corner, it has wood burner to keep you warm whatever the weather. There are water sports within walking descend, and beautiful villages like cirencester,Bibury a short drive away. The host was amazing and respond quickly no mater the weather this home is romantic stylish and comfortable and an experience you must have." "If possible, this place is even better in real life! We stayed here for a romantic weekend and it didn’t disappoint! The lodge is perfectly positioned nestled amongst the lakes with the beautiful woodland giving you the right amount of privacy, making you feel like you’re completely alone with a beautiful view of the lakes! The interiors are done to a high spec, with beautiful decor and plenty of light throughout the lodge. Florina made us feel so welcome with little touches including flowers and a birthday cake and was always quick to respond to any questions we had as well as recommend local walks and pubs. Day to night, you can easily spend hours cooped up here watching the scenery and enjoying the log fire. It’s almost too good we don’t want to tell people about this hidden gem...but we will! We will be back!" "Truly the most fantastic place we have ever stayed !! A perfect venue for my new wife and I to celebrate our belated honeymoon. A completely serene, private and relaxing venue that offered everything that we could want (and more). Thank you to Florina and Mr Simon. We look forward to seeing you again soon !" "Island lodge is a real find, a gorgeous lodge that is very stylish and everything is brand new. It's secluded and very private and made for a special birthday treat. Great communication by Florina and couldn't recommend enough!" "The island lodge is such a wonderful place to stay. It is a beautiful setting (we could have spent hours just looking out the windows) and was so cosy inside with the log burner. The extra touches were also appreciated and we can’t wait to visit again." "Incredible lodge... one of a kind. We had a wonderful winter stay and will be back back!" "We had an amazing time here. Florina was the perfect host - she was extremely quick to respond to any communications we had before arriving and during our stay, and was there to meet us when we arrived and show us around. We loved the cake/wine you left for us and that you had lit the fire before we came, so the house was lovely and warm! The house was completely spotless and the view is even better in real life than in pictures. There are two other houses nearby and one going up across the lake, but with big distances between and we still felt very alone/isolated. It was extremely quiet. You will definitely need a car as the only things close by were a village with just a couple of pubs and a small supermarket, but once you're in the car, you'll want for nothing outside of a few minutes' drive away. The beds were really comfy and all the linens very soft. Be warned - there are no blinds in this house, so the sunlight might wake you, but you'll be so thrilled to be waking up in the Cotswolds that you won't mind. There are very basic amenities - you have everything you need for a couple of days, but if you're planning to stay for longer and cook big meals, you might want to bring your own kitchenware and cleaning products. Some wooden spoons would have been nice! We suspect that people might leave these as they go, but we were the first ever guests in. Overall we had a fantastic time, would happily return, and will recommend to all our friends." "This house is absolutely wonderful, and doesn't disappoint. The pictures are an exact match to what you see when you arrive and we really didn't want to leave! Our host was fantastic, super quick responses and thoughtful, nothing was too much trouble. The property is totally magical and has everything you need to hide away for a weekend. All amenities have been carefully thought through, excellent check in instructions. We can't wait to go back and wish we had booked it for longer! Thank you Florina!!" "We had an amazing time at Island Lodge. Everything was spot on! Extremely clean with all the amenities, easy to find, beautiful and stylish lodge in an amazing location. We are already planning to come back in summer! Aline & David"
"Stunning property in a lovely location. We had a great time!!" "We spent a relaxing and peaceful Christmas at Willow Lodge. The property is just as lovely as it looks in the pictures, and we were impressed at the quality of the overall design and finishes. The festive treats and decorations that greeted us when we arrived were a thoughtful touch. We spent hours watching the birds on the lake and enjoying the views. The woodburner works a treat, and kept the whole place so warm and cosy. When we weren't on the sofa, the Lodge was a great base to explore the local village and surrounding water parks on foot. We appreciated how well-equipped and organised Willow Lodge is. Everything we needed was to hand. The check-in instructions and Florina's responses were efficient and helpful. Highly recommended!" "We loved staying in the Willow Lodge so so much, it was clean and beautiful, so well equipped with lovely little touches and a nice welcoming and homely feel. I didn’t want to leave! The house is made almost entirely of glass but still feels like the most private and safe place you could be. We received friendly messages and good level of communication via the app but it was not at all imposing - we were left to our own devices and felt truly relaxed for our 3 night stay over New Year." " A stunning space in beautiful surroundings. My fiance and I rang in New Year in the lodge and after a hectic end to the year, the relaxing surroundings were just what we needed. Florina was brilliant to deal with and made the process even more enjoyable. thank you! " "The home is straight out of a catalogue! The deck , fireplace, kitchen, interiors, the water, the quaint walk trails outside - it's beautiful! The house is very thoughtfully stocked up and clean. We had a wonderful time, would be back soon!" "A must visit! The pictures don’t do it justice, much better in real life. Secluded and picturesque, perfect for a romantic weekend away. The local town only 10 minute drive, everything you need. Just an absolutely perfect place, 5 star.